Inappropriate? Maybe. But, for me, humor has always been my “go to” when dealing with people and this group was the group that I could share just about anything with. 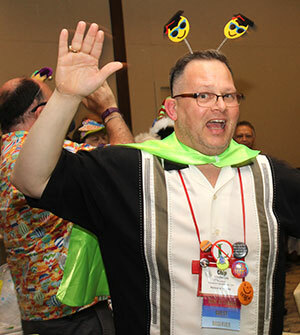 It is the Association for Applied and Therapeutic Humor (www.aath.org) and I’ve been a member for the past 12 years. We’re an eclectic group. Our membership is comprised of Doctors, Nurses, Social Workers, Psychologists…..just about anyone who has an appreciation for the funny side of life and who look for ways to apply it in all aspects of their work and their lives. We’re more than goof balls, odd balls and outcasts (although some of those adjectives do apply), we like to know how what we’re doing works. The conference is fun but also has a serious side where the science behind the laughs is shared. For me, this was my first year back after a two year absence. One year off was due to my Dad’s passing and last year was due to my colon passing (long story….I had a perforated bowel and was in the hospital for a week at conference time). It was an extraordinary experience (the conference...not the perforated bowel) and I wanted to share just a few of the things I took away from the 4 days I had with these incredible people. First, being funny isn’t as important as applying funny. I’ve always been funny. It’s easy for me. Having grown up the youngest in a funny family, it was something that just came natural. That’s not the case for everyone. Telling a joke or trying to come up with something funny in a social situation can cause angst, stress and be counter productive. Dr. Willibald Ruch, Professor of Psychology at the University of Zurich, Switzerland, shared his most current research on how humor interventions effect happiness. Through his work, he found that finding 3 funny things a day and applying humor daily in your life can increase overall happiness for up to six months after the intervention. It was fascinating. This completely made sense to me. A few years ago while in a mental slump, I decided to force myself to post something funny every morning on Facebook. I did that every day for an entire year. Mostly, funny jokes (but they had to be short, smart, and make ME laugh). It had a ripple effect where it impacted others and their joy but…it was all for me and did help me move out of that dark place. So don’t worry about learning a joke, find the funny and apply it. Or, like me, throw some funny things up on Facebook. It’s not important what you do, it’s only important that you do. Second, for me, laughing hits 2 of the top 3 ways to metabolize stress. I have always enjoyed a good laugh. Whether I instigate it or it comes from another, few things compare with the euphoria I feel after a knee slapping, nose snorting, breath gasping laugh. John Coyle, one of world’s leading experts in Design Thinking (and also Olympic Silver Medalist), shared in his keynote about the top ways we metabolize our stress. When we’re stressed, there are a lot of chemical reactions in our brain and body that need to be counter acted (science-y stuff). The top 3 things he shared that help decrease the negative effects of stress were low grade exercise, social intimacy and physical intimacy. Laughter definitely hits the first two (and could with the third if you’re confident enough). When we laugh, it increases the heart rate, brings more oxygen into the blood and also provides a “internal jogging” for the abdomen. There’s the low grade exercise! Socially, few things connect me quicker with others than sharing a laugh. It brings strangers into my inner sanctum and tethers friends to my soul. So, if you’re stressed, find some friends to laugh with and get a little more balance back to your life. Or, at the very least, watch something that makes you laugh. Lastly, relationships rejuvenate. I wasn’t depressed when I got to the conference but I sure did feel different when I left. I haven’t had that much fun or laughed so much in a really long time. There is a difference in my spirit, my outlook and also my thought processes. I see possibilities that I didn’t before and the motivation to bring them to fruition. I also feel a closeness to those I shared all of that joy with….unlike that I feel in normal interactions. There are many things in life that aren’t funny. When we’re in the mire, there can be a tendency to isolate ourselves (if you’re like me) and ruminate about how bad we have it. I would suggest reaching out to those who bring more joy and less stress into your life. You’ll walk away feeling better and having a better outlook on whatever you’re facing. Within our society we tend to look at humor as a “nice to have” versus a “need to have.” For me, it’s a GOT TO HAVE! It has been the one constant in my life that has helped me connect, communicate and cope. So, if life has been serving you up some crap, put a little humor in the mix and see how it works! I think you’ll find yourself better off and a little more happy. Chip Lutz, MSEd, CLL, is the Chief Laughing Officer (CLO) and founder of Unconventional Leader and has 30 years of years leadership experience. A retired Navy Officer, he has had two command tours, served as the Director of Security for Naval District Washington, DC, during September 11th, and has held various other key leadership positions. He prides himself on keeping it “light” while getting the job done. Comments on "If I Can't Laugh, I'll Die!"